Three years ago today, I got married to the love of my life and became a wife. After a week of anniversary celebrations we had the last few days, I thought it was apt to reflect on our journey to the altar. It all started with the hubby's secret proposal to me at the darkest part of East Coast Park on 7th July 2007. 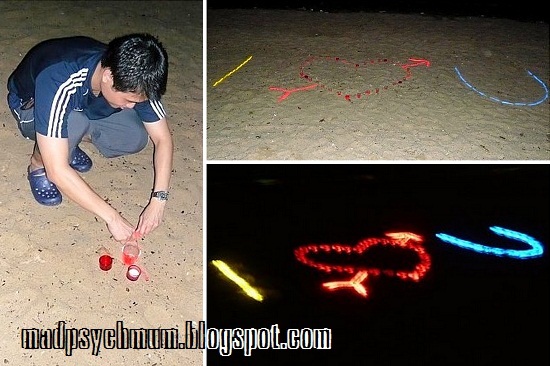 With the help of his friends, he put together a 'message' on the beach using light sticks. The heart was made by breaking the light stickes and pouring the liquid into jars, which he said was a really difficult thing to do. I had absolutely no idea of his plans until we arrived at the beach. Me (walking towards the restaurant): I'm sooo hungry! Then-boyfriend-now-hubby: Hey why don't we take a walk at the beach first? And then I suspected something was up! It was so unlike the unromantic hubby to choose a walk in the park over food. Like seriously? When he popped the question, of course I said yes, even though I was only 23 years old! Haha. We were both very poor then as I just started graduate school so we decided to have our bridal photoshoot at Johor Bahru instead of Singapore as it was 50% cheaper. It was a tiring day but I really loved our shots at a real waterfall! Everyone thought it was photoshopped but we actually went into the waters and got our hands and feet wet! We decided to get married on 2nd May 2009 because it was an easy date to remember (day after labour day) and because it fell on a Saturday (I would have preferred if it were 7th September, which is the day we became a couple, but that was on a Thursday). We chose to get married in the 1st church that the hubby attended when he's a young boy, brought there by his late paternal grandmother. I used to go to this church once in a while too when my maternal grandmother attended church when she was healthier so you can say we both have some affirnity with this place. It had the old school cross and pews that we both liked =) Although the day did not go as smoothly as planned, we still had a great time with our family and friends. The next day (we didn't want everything on one day for fear that we'll be too tired), we held our wedding banquet at Dragon Gate Restaurant at Harborfront Centre (I'm told by friends it's not there anymore). As with tradition at every wedding banquet, friends of the hubby got him so drunk, he nearly couldn't stand up. Amazingly, he was still conscious enough to shake hands and thank our guests as they left.